BreakThru Radio (BTR), the Internet's source for the World's Best Independent Music, announced today the world premiere of its brand new specialty show from DJ Lottie, called "Lottie's Sideshow Acts". This unconventional new show offers listeners the opportunity to hear a variety of bands that specialize in an Eastern European kind of feel. "Lottie's Sideshow Acts" is the latest installment in the station's successful series of specialty shows. DJ Lottie's groundbreaking new show can be found only on http://www.breakthruradio.com. "Lottie's Sideshow Acts," was created to give BTR listeners a rare chance to hear an eclectic mix of music that they would not have the opportunity to hear on mainstream radio. The show features bands from across the world, from Brooklyn to Macedonia to Yugoslavia. 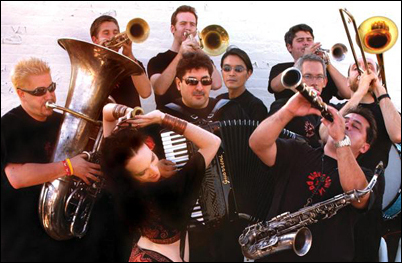 The playlist includes talented acts such as Slavic Soul Party, Circus Contraption, and The Ambitious Orchestra. A new edition of "Lottie's Sideshow Acts" will air on BTR every month. "I am going to feature the best of the bands that showcase some of that old world lure," explains DJ Lottie, who describes the new show as having an "eastern European meets gypsy meets the Balkans" kind of sound. "Think men with handlebar mustaches, accordions and violins, but with a circus style! There will be clarinets, trombones and trumpets!" With the addition of "Lottie's Sideshow Acts," BTR further fulfills its goal of offering listeners complete on-demand, free programming that caters to whatever music niche in which their taste lies. Other BTR specialty shows include a folk show, a blues show, a heavy metal show, a dance music show and a hip-hop show. "Lottie's Sideshow Acts" will premiere on BTR today and will be available in the station's archive and program guide, along with all of BTR's previous specialty programs. Listeners can tune in to hear DJ Lottie's new show by visiting http://www.breakthruradio.com.